Put the berries in a saucepan with a quarter of the chopped stem ginger and 2 tablespoons of the ginger syrup. Heat through until the berries are warm, then set aside. Stir half of the remaining ginger into the mascarpone with a further 2 tablespoons of ginger syrup and a ¼ cup of the fresh custard. Divide the cookies between 6 serving glasses or cups. 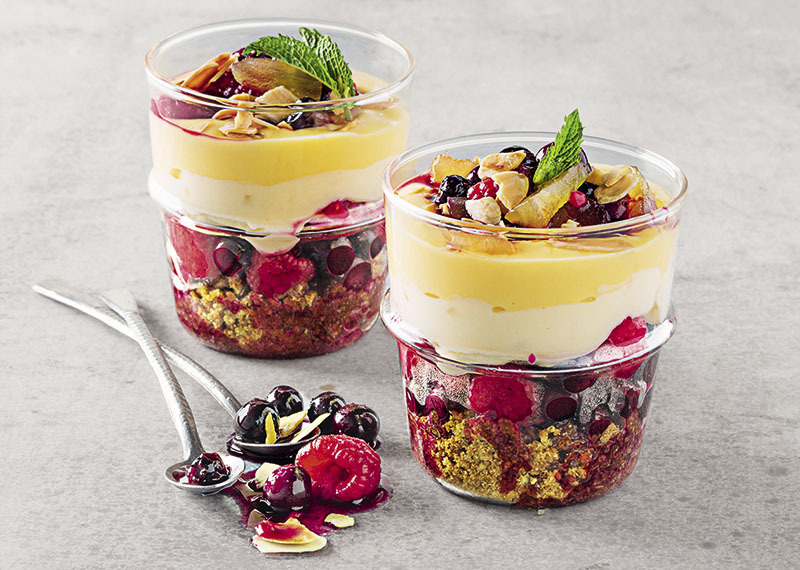 Top with a little fruit, a little mascarpone and a little custard, then repeat until all of the ingredients have been used up, finishing with a fruit layer. Drizzle with the remaining ginger syrup and sprinkle with the remaining stem ginger and the almonds.